As a new television-savvy president wields his unique brand of politics from the White House on the world stage, a CNN Film exploring an earlier president’s novel approach to communications comes to CNN from filmmakers Pacho Velez and Sierra Pettengill. The Reagan Show is an all-archival film, comprised largely of footage filmed by the U.S. Naval Photographic unit and called “WHTV.” This material documented Reagan’s eight years in the White House and was preserved by the Ronald Reagan Presidential Library and Museum. While previous administrations made WHTV, the Reagan White House far exceeded its predecessors in the volume of filmed self-documentation that it produced. Archival news footage from the era augments this fly-on-the-wall perspective on the dramatic history and pageantry of the Reagan years. The Reagan Show also represents a new milestone for CNN Films, which celebrates its fifth anniversary this fall. Velez and Pettengill are alumni of the inaugural filmmakers’ retreat created by a partnership with Tribeca Film Institute, Camden International Film Festival, and CNN Films in 2015. Each June, the annual workshop is hosted by Points North Institute in Camden and Rockport, Maine, and provides master classes, mentorship, and guidance to emerging documentary filmmakers. This film is the first co-production to be acquired for broadcast by CNN Films from alumni of the workshop, fulfilling a goal of CNN Films to contribute to the industry through nurturing documentary filmmaking and filmmakers. 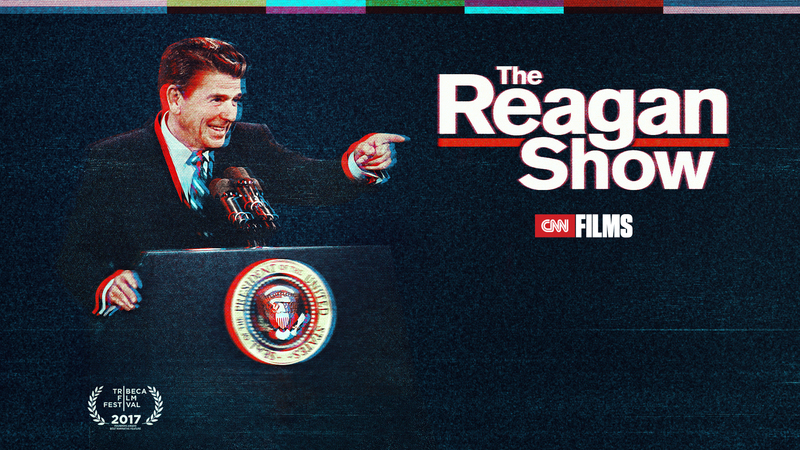 The Reagan Show, will premiere on CNN/U.S. Monday, Sept. 4 at 9:00pm and Tuesday, Sept. 5 at 12:30am, with limited commercial interruption. The film will encore Saturday, Sept. 9 from 10:00pm to 11:30pm and Sunday, Sept. 10 from 2:30am to 4:00am on CNN/U.S., again with limited commercial interruption. The Reagan Show will also screen for the public at New York’s Museum of the Moving Image on Wednesday, Aug. 30 at 7:00pm, followed by a discussion with the co-directors, moderated by CNN’s Brian Stelter. All times Eastern. “We went through nearly 1,000 hours of footage, and think that this all-archival approach allows for an exciting insight into the tools of performance that Reagan employed,” Velez and Pettengill said about The Reagan Show. Through the juxtaposition of network news coverage and WHTV footage, the viewer often gains a behind-the-scenes view of many of the events profiled in the film: the president at inauguration, pardoning turkeys in the Rose Garden, and negotiating arms reductions with Mikhail Gorbachev. Often, this technique reveals how the event was conceived by Reagan and his White House planners, as well as how the public would eventually see the event later through the network news. “Substantively and stylistically, Ronald Reagan was perhaps the most skilled communicator-in-chief of our modern era. Pacho and Sierra have made an impressive and extensively-researched film that demonstrates how essential media communication skills are to a president’s success and legacy” said Amy Entelis, executive vice president for talent and content development for CNN Worldwide. The filmmakers ultimately focus on the geopolitical rivalry between America and the Soviet Union, the most fraught and consequential diplomatic relationship of the Reagan era. The film shows how, as the former film and television star began his second term as president, Reagan was challenged on the world stage by the relatively youthful new Soviet leader. Gorbachev, shrewdly determined to wield power through leveraging his own charisma and media savvy to modernize the image of his nation, rarely missed an opportunity to play any diplomatic advantage to global news cameras. Many of the pivotal inflection points in the critical INF (Intermediate-Range Nuclear Forces) Treaty deliberations between these two men were made for television, and conducted before an expectant international press corps. The film shows how, alongside the technical negotiations, Reagan’s years of actor-training helped him gain advantage symbolically, which had realpolitik consequences that seem to continue to have lasting influence for the U.S.-Russia relationship. Reflecting on Reagan’s time in office, journalist Peter Jennings remarks in a contemporaneous news report included in the film: “No presidency before this one was so often judged as if it were a performing art. I shudder when it’s suggested that politicians who come after him are going to have to succeed first on television.” With political irony and insight, the ‘media archaeology’ of The Reagan Show reveals how the communicator-in-chief effectively used his skills to his advantage for official diplomacy, as well as to establish his legacy in the role of a lifetime, the presidency. In addition to the telecasts, The Reagan Show will also stream live for subscribers via CNNgo on Sept. 4 (at www.CNN.com/go and via CNNgo apps for AppleTV, Roku, Amazon Fire, Samsung Smart TV, and Android TV) and on the CNN mobile apps for iOS and Android. The film will be available the day after the premiere (Monday, Sept. 5) on demand via cable/satellite systems, CNNgo platforms, and CNN mobile apps. The Reagan Show is a CNN Films co-production in association with Impact Partners and Artemis Rising Foundation, and presented for U.S. broadcast exclusively by CNN Films. The film is executive produced by Dan Cogan, Amy Entelis, Houston King, and Regina Scully. The film is edited and written by Francisco Bello and written by Josh Alexander; Daniel Garber and David Barker also edited the film. Laura Karpman is the film’s music composer. The supervising producer is Courtney Sexton. CNN Films, celebrating its fifth year in 2017, produces and acquires documentary feature and short films for theatrical and festival exhibition and distribution across CNN’s multiple platforms. Amy Entelis, executive vice president of talent and content development, oversees the strategy for CNN Films; Courtney Sexton, vice president for CNN Films, works day-to-day with filmmakers to oversee projects. For more information about CNN Films, please visit www.CNN.com/CNNFilms and follow @CNNFilms via Twitter.